Hey everyone, Morgan here, and today, I'm revealing a desperately needed update to my living room! I swear, five years ago, we moved into our house, put the old furniture in the living room, leaned a few older pieces of art against the wall and then it just stayed like that...until now! I had no idea how badly we needed an update until I really starting taking a look at what was in the room. The art, or lack thereof, was what bothered me the most. We have a really great gallery wall in the dining room, but the poor living room, seemed to just get the leftovers. So, thanks to the truly unique selection of art at minted.com, I found so many pieces that really spoke to me. For someone that feels like it's so important to surround yourself with things that you love, it's sort of embarrassing to think how long I left everything the way it was. The art in your home should speak to you, reflect you and also continuously inspire you. 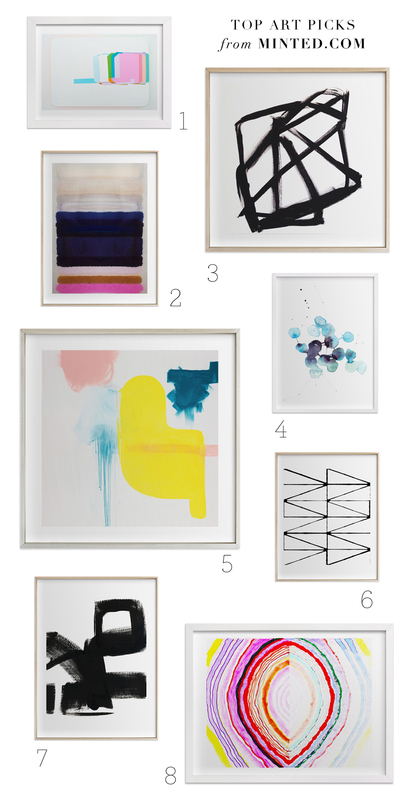 I scoured the vast selection of art on minted.com and seriously had such a hard time narrowing down my favorites. There are SO. MANY. AMAZING. PIECES! There's limited edition fine art, typography art, photography and even foil-pressed options! And here is where I landed!!! As you know, I LOVE color. I do. But sometimes, for my home, I like things to be a little more neutral. Plus, as my husband can attest, I also tend to change things out from time to time, so a pair of black and white pieces seemed like the perfect solution to go above this credenza! I went with Untitled 1 by Jaime Derringer and Visionary 2 by trbdesign. I seriously couldn't be happier with these! And do you see those frames? Minted just released a whole range of metallic frames which are to die for! I went with the matte brass and it's beautiful in person!! But check them all out because there is also matte copper, champagne silver, and brushed silver! For the mantle, I had previously just had a large mirror up there so this huge hit of art is such a welcome change! This piece, Sometimes I Wish Beginnings Were Ends by Jaime Derringer, had caught my eye from the first time I scanned through the minted art and I couldn't stop thinking about it ever since. The simplicity of layout mixed with the detail in each one of the forms makes it endlessly interesting to look at everyday. I chose the champagne silver frame for this. Totally loving the mix of metallics going on here. Seriously, photos don't even do it justice. But, I can't explain how happy this piece makes me! So, here we are! Living room update complete! Oh, I should mention that my fireplace also used to be brown, iridescent, crackle tile (yes, you read that right) that was just not working for me. 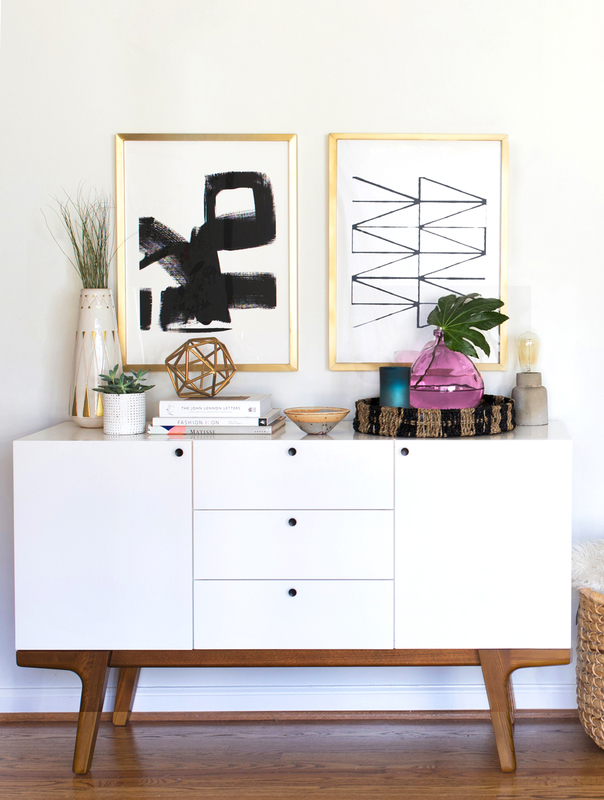 We painted that white (whew) and with the addition of this, most perfect, white, mid century inspired credenza, it feels like such a bright, modern place to call home! Huge thanks to minted.com for connecting with the best independent artists for truly unique art and putting it all in one place for us. It's just too perfect!